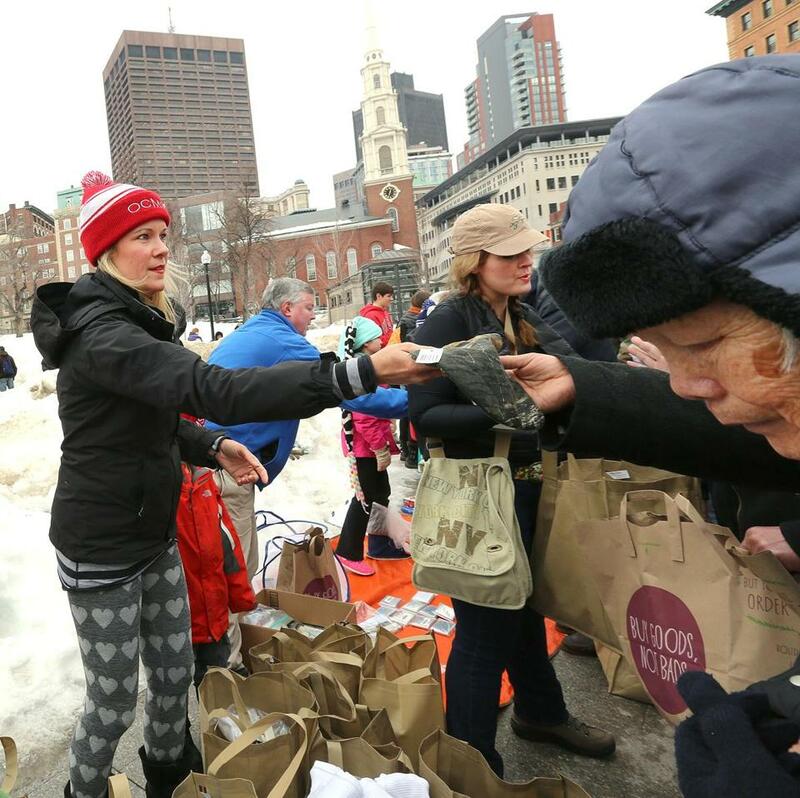 COPE volunteers handed out clothing, toiletries, and food to people on Boston Common. HINGHAM — Not long after the sudden closure of the Long Island homeless shelter last fall, Joan Bennett drove into Boston to hand out Ziploc bags of toiletries and socks to people on the streets. But she realized they had nowhere to put them. So she posted a plea for backpacks on a Hingham message board, and by the end of the day, her porch was covered. Soon she was back in Boston, with more Hingham residents and a white Mercedes cargo van piled high with backpacks, coats, and sandwiches. The volunteers, many supported by high-flying finance jobs, have been driving the van from this affluent South Shore community into Boston a few times a month, reaching across the divide between rich and poor to make people’s lives more comfortable. Many had written checks to charities in the past but had never volunteered. Judah Snyder received a bag of items distributed by COPE volunteers on the Boston Common earlier this month. On a brisk night in early February, Bennett approached two women staying warm inside a McDonald’s on Massachusetts Avenue. “Do you need help?” Bennett asked. “Always,” one replied, her voice husky and her eyebrows plucked thin. Some of the 700 former residents of the homeless shelter on Long Island now live in cramped, disorienting conditions. Bennett led the pair out to the van. The woman with the thin eyebrows, a 33-year-old heroin addict, tried on a gray fleece coat, then traded it for a black EMS jacket. She needed to get back to the shelter, she said between bites of a peanut butter and jelly sandwich, to secure an overflow spot on the kitchen floor. One by one, others walked up. One man asked for gloves, another wanted a sweatshirt, many needed dry socks. A woman whose hands were noticeably blue spun around in a white North Face down coat, then headed back into the McDonald’s bathroom to look in the mirror. A man pointed to his tattered sneakers: “I’ve glued these shoes back together like six different times,” he said. 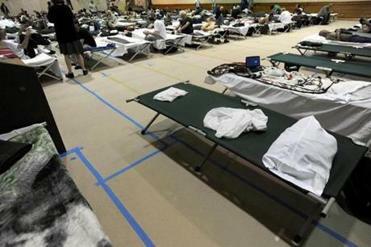 The state’s homeless population has increased sharply in recent years, and the closure of the Long Island shelter and the brutal snowstorms that followed made the winter particularly harsh. As the need increased, so did the number of people wanting to help. Every pair of socks a nonprofit doesn’t have to buy means more funds for mental health, housing, and employment, advocates say. With the help of school drives and social media, donations poured in to the Hingham group, called COPE — Communities Offer Practical Engagement — many purchased online and shipped to Bennett, a part-time home health aide who had a relative stay at the Long Island shelter. The volunteers drive the van to Boston Medical Center, Downtown Crossing, and other spots where homeless people gather. If they don’t have what they need, they get it. One man wanted baloney sandwiches, which were delivered to him the next week. A blind man asked for a suitcase with wheels, and he got one — packed with supplies. 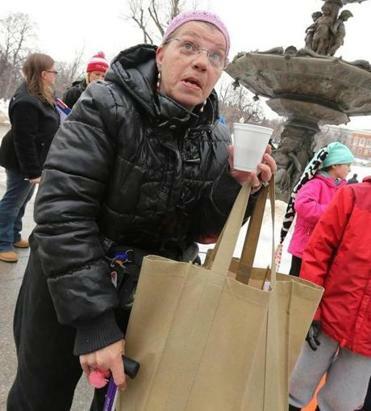 COPE volunteers from Hingham, including Amy Torrey, handed out clothing on Boston Common. An appeal for boots, men’s 10½ triple wide, compelled a benefactor from Chicopee to buy a pair from Walmart, drive to South Station, and kneel down to put them on the feet of the man in need. At South Station, a young man whose belongings were stolen shrugged on a Ralph Lauren jacket. A woman with plastic bags tied over her wet sneakers, who said she slept under a bridge, left with a sack of clothing. A woman with a jagged scar on her face, put there by her husband, she said, found just the right purple coat. Back in the van, volunteers popped wasabi peas and talked about CrossFit training and Disneyland. But mostly they talked about the homeless. “Excuse my ignorance, but how expensive is heroin?” said one woman. The ultimate goal of COPE is to spread the concept to other communities and open people’s eyes to poverty. “He just looked like a normal guy that I would see in church,” one remarked of a man in search of clothing. Hingham, population 22,000, has a median household income of nearly $107,000, double what it is in Boston. Several of the COPE volunteers and donors — more than 500 in all — are college-educated, stay-at-home mothers married to well-paid finance or sales executives. They attend galas, own vacation homes, and send their children to private schools. Katherine Bennett, a self-described “ex-pampered-housewife” who expanded COPE’s reach on social media, said Hingham residents are good-hearted but “don’t have regular contact with how the other half lives.” Bennett’s former husband is from a wealthy Hingham family and still supports her and their children, she said, and she is determined to share not just capital, but compassion. Being part of COPE is humbling, said Jill Sheehan, a part-time personal shopper and sales representative for a high-end clothing line. “I’m always trying to help my kids understand, not everyone has this much money,” she said. Maria Bromley, a journalist-turned-stay-at-home mother who is married to the president of John Hancock Financial Services, makes a point to ask people their names. “In regular life we tend to ignore them,” she said. Bromley was among the volunteers who took their families to Boston Common on a recent Sunday afternoon. They lugged underwear and thermal shirts up from the parking garage and set out packages of hand warmers and Mylar blankets. A cheerful 65-year-old man who gave his name as Bill — “I’m what comes at the first of the month” — was on the Common for a free weekly lunch and church service. People often look down on the poor, or avoid them, said Bill, who relies on donations when his Social Security check and food stamps run out.